This gentle-paced cycling holiday takes in the best vineyards, villages and ancient churches of Cote d' Or. Along the way, enjoy traditional local cuisine, accompanied by one of the many eminent 'grand cru' wines produced in the region. Beaune - Wine capital of the Cote d'Or. Your total cycling distance today is approximately 38 kilometres. Your total cycling distance today is approximately 27 kilometres. 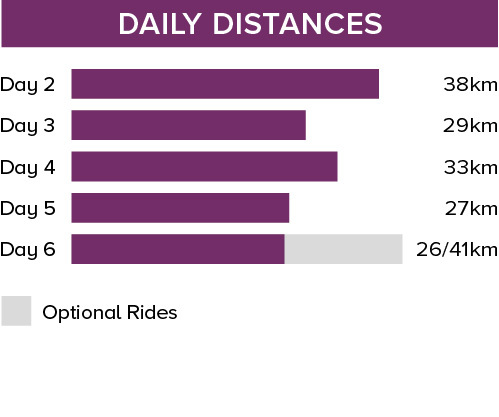 Your total cycling distance today is approximately 26 or 41 kilometres, depending on your route. Throughout this trip there are many opporunities to sample the regions tasty cuisine and locally made Burgandy wines. Many of the wineries offer tours and there are lots of great photo stops and places to stop for a relaxing stroll along the way. Day 1 - Depending on your arrival time, if staying in Meursault you may wish to visit the Chateau, or if staying in Saint-Romain walk up to the chateaux ruins above the village to enjoy the views. Day 5 - On your way through Nuits-Saint-Georges you may wish to visit Le Cassissium blackcurrent museum. Bring cycling gear such as quick drying cycle tops, padded cycle shorts and cycle gloves. Remember that the weather is slightly more changeable in northern France, and it can be cool, especially at night and at the start and end of the season, so bring a warmer jacket/fleece. A waterproof cycle jacket is recommended in case of rain. A light windproof jacket is always useful. On all Explore cycle holidays we strongly recommend you bring along and wear your cycle helmet. In case of an accident resulting in personal injury, certain insurance policies are invalidated in cases where a helmet was not being worn. Cycle glasses (to protect against dust, insects, pollen, sun etc) , cycle gloves (padded for more comfort) and a water bottle or water delivery system (eg camelback or platypus). Please note that it is a legal requirement to wear a helmet while cycling in France. In case of an accident resulting in personal injury, certain insurance policies (explore included) are invalidated in cases where a helmet was not being worn. You may choose to bring your own gel seat cover for added comfort. If a handle bar bag or pannier is not provided (check bike details) then you may like to bring a small rucksack to wear while cycling. Please carry some or all of your cycling equipment e.g. helmet as part of your hand luggage. We'd recommend return flights into Lyon or Paris Airports which are served by both budget (including Easyjet, Flybe) and non-budget airlines (including British Airways) from multiple airports in the UK. At the start of your trip you can fly into Lyon or Paris airport. If you are driving into Burgundy you can park the car in a free parking area in Saint Romain where it can stay for the week. 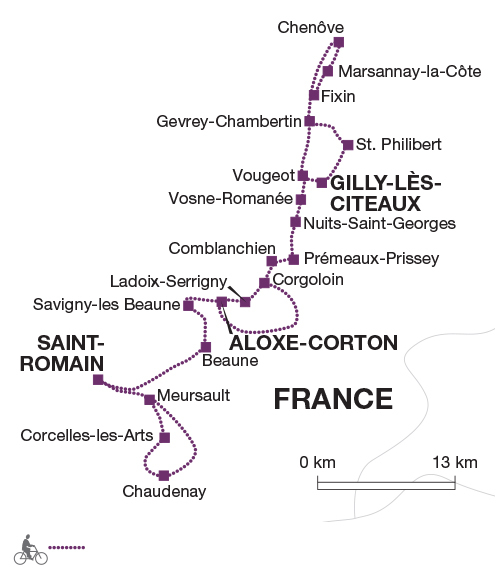 At the end of the trip you can take a taxi to Saint Romain or take the train from Gilly to Beaune and then a taxi to Saint Romain. Travel by train from Lyon to Beaune train station from where you can take a taxi (approx. 25 Euros). At the end of your trip you can fly back from either Lyon or Paris airport. From Gilly take the local train to Dijon where you connect to Lyon. From Gilly take the local train to Dijon where you connect to Paris. A private arrival transfer can be arranged (at additional cost) from Beaune train station to Meursault and on departure from Gilly back to Meursault. These transfers must be booked in advance. On this journey you cycle 153 km over five days (an average of 31 km per day) with a further optional ride available. The terrain is mostly on gently undulating hills and open valleys with no shade on the roads. Most of the route is on tarmac country lanes and secondary roads with little traffic and a few sections of good dirt roads. Traffic increases near the larger towns. We have graded the route as easy. Your included bike is a 21 gear hybrid bike and will be the correct frame size for your height. A handlebar bag is provided and you are able to fit your own pedals or saddle if you wish to bring them. A lock is provided. You will be required to sign an agreement of care upon receipt of the bike. All you need to bring is your own helmet. Mon 1 Apr 2019 - Thu 31 Oct 2019 Your trip can depart anytime between the above dates. Contact us for triple room requests and solo traveller prices.